Quantum Catalyst PTs Inshore Saltwater Spinning Reels feature Saltgard six-layer corrosion protection, ThinLine aluminum body and side-cover, TiMAG Salt titanium bail with magnetic tip, stacked ceramic front-adjustable drag, nine polymer stainless hybrid PT bearings, and Continuous Anti-Reverse. 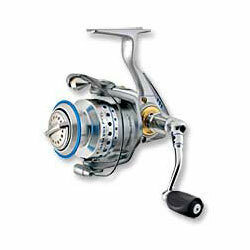 "i have use quatum baitcasters befor but this is my very first quatum spinning reel and i am very surprised at the reel. it works great and i have had not problems with it"
"this is an awesome little reel, very, very smooth, especially like the drag"